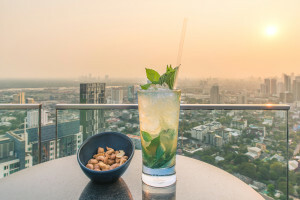 The warm weather is primetime to spend a night at a rooftop bar. Though they’re typically on the pricey side, New York’s skyline sanctuaries always make for a good time. All Island’s list of the best NYC rooftop bars will provide you with a guide for drinks and a view as you relax high above the urban hustle and bustle. Just a few feet away from the Brooklyn-Queens Expressway, Night of Joy is a Williamsburg rooftop bar with a relaxed vibe and great happy hour deals. From 5 pm - 8 pm every day, you can grab $4 beers and $6 cocktails, which is a lot cheaper than most other NYC rooftop bars. The patio furniture and graffiti-covered walls also make an evening at Night of Joy a more casual experience than other rooftop bars throughout NYC. Located atop the Strand Hotel, the Top of the Strand is open year-round thanks to a retractable glass roof. With great views of the Empire State Building and an agreeable staff, the Top of the Strand is a great place to stop for a few drinks if you’re around midtown Manhattan and looking for a bar with a club-like feel. Bar Hugo is located on top of the Hugo Hotel in SoHo. It boasts excellent views of the World Trade Center and Hudson River. This luxurious lounge also has great décor with enormous windows, a wood deck and blown glass light ball fixtures. Show up sporting their business-casual dress code between 5 pm and 7 pm any day between Monday and Thursday to score $5 beers and $6 wine for happy hour. With two locations, one right in the heart of Times Square on West 45th Street between 6th Avenue and Broadway, and the other on East 45th Street between 2nd and 3rd Avenues, the Perfect Pint offers a breath of fresh air from other midtown Irish bars. The Perfect Pint has over 30 beers on tap. The Midtown West Location offers an outdoor balcony that overlooks hectic Times Square, while the Midtown East location has a rooftop smoking loft. Big screen TVs that show every major sporting event will make sports fans feel welcome, too. Right above Eataly in the Flatiron District, La Birreria offers an enormous range of beers and delicious Italian food. The retractable glass roof will allow you to enjoy their in-house brewed beer and Austrian and German influenced Italian cuisine. This is among the best food offered by any of the many NYC rooftops bars. We’re sure you’ll have a great time at these NYC rooftops bars, no matter which you choose. Whether you’re too full of fantastic food or happy hour cocktails to drive, All Island is ready to get you back home. Call us at a location near you or make a reservation online.